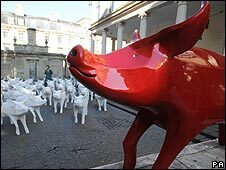 More than £200,000 was raised when 70 life-sized pig sculptures were sold at an auction in Bath. The life-sized models were designed to boost awareness of a 3,000-year-old legend, which tells of how King Bladud founded the city. The cash raised is to be used to support the Two Tunnels project - a cycle track linking the centre of Bath with the south of the city. This plans to run through two disused railway tunnels under Combe Down. At the auction in the city's Assembly Rooms the highest bid received for a single pig was for Sir Peter Blake's Tattooed pig, sponsored by Wellow village community, at £21,000, followed by Carmina and Pig in Clover both at £6,800. The remaining 35 pigs are to be sold via an online auction. King Bladud is reputed to have discovered the healing powers of its hot spring waters while walking with his swine.